Fort Myers, FL, January 31, 2017 — Property Debt Research, The Municipal Lien Search Company, announced today their partnership with Habitat for Humanity of Florida to support their goal of helping people achieve the American Dream of home ownership. Property Debt Research has committed to providing financial support, encouraging and enabling employee volunteers, and promoting advocacy for Habitat programs throughout all 67 Florida counties. 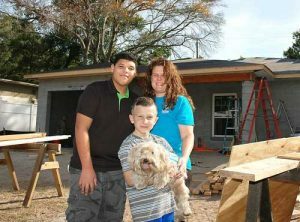 In communities across Florida, Habitat for Humanity works with families to make the challenge of homeownership a reality. For Property Debt Research, the opportunity to significantly impact the lives of families in the cities and counties they serve is a commitment to helping develop a more prosperous Florida. “Habitat for Humanity’s affiliates in Florida build more homes than any other state. We are proud that Property Debt Research, one of the fastest-growing companies in the country, is partnering with us!” said Barbara Inman, President/CEO, Habitat for Humanity of Florida. For more information about Habitat for Humanity of Florida, please call (727) 475-1363 or visit their website at http://habitatflorida.org. Founded in 2009, Habitat for Humanity of Florida, Inc. is one of 31 State Support Organizations in the United States. Its mission is to support the work of the 57 Habitat for Humanity affiliates located in Florida in order to operate with excellence, expand our community impact, and increase families served. There are more Habitat for Humanity homes constructed in Florida than in any other state. To-date, more than 16,000 homes have been built with homeowners contributing more than $11 million annually in property taxes. Our total state-wide economic impact is more than $300 million annually, including homebuilding activities and our ReStore operations, which accept donations of building materials, furniture, and appliances and re-sell them to the general public. Habitat for Humanity of Florida supports the affiliates’ work through advocacy, resource development, training and technical assistance, and disaster recovery. Property Debt Research, the leader in Municipal Lien Search reports, has over 20 years of service to real estate professionals. They are ranked in the top half of the Inc.5000 list of Fastest-Growing Private Companies in America. The company specializes in researching municipal liens and debt on residential and commercial properties in Florida and Nationwide. They also provide HOA Estoppel letter research. Property Debt Research offers exceptional client service and competitive rates. All of Property Debt Research reports are 100% Guaranteed and backed by a $1 million E&O insurance policy. In addition to their years of experience and their million-dollar E&O insurance policy, Property Debt Research has also invested significantly in a streamlined customer portal, which makes ordering and tracking municipal taxes and debt search reports easy, fast, and available 24/7.